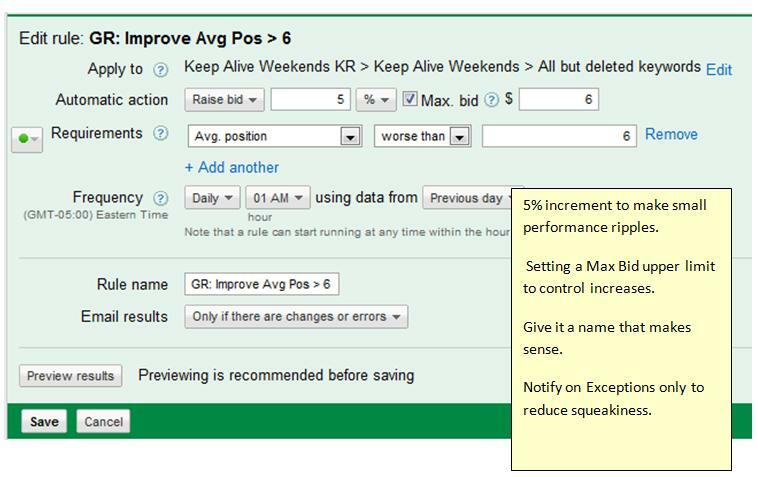 Make the automation rules at the appropriate level. They can be set at the campaign, adgroup, or keyword level. Use overlapping rules to handle exceptions. Note that when multiple rules apply, ALL will trigger, so approach this techinque with caution. Running rules during a campaign’s “off” time makes sense for a cleaner transition. I have my rules set up to run at 1am using the previous day’s data. Note: Using CPA bidding eliminates the need to make these finer-grained adjustments all together. Example: I have a campaign using Position Preference, and I am typically using a 3-6 position preference (avoiding the Top 2). To set up an Automated Rule to approximate this, I would add the following rules. A similar rule should then be set up to Adjust downwards if the Avg Pos gets too “good”. Editing Automation Rules is like editing ads: the old version is deleted and the new one inserted, but the old rule lingers as a “deleted” rule. Changing the Notifications setting counts as changing the rule, even if the triggers and effects don’t change. The good news is that there are no bidding history issues created by this swap-out. The Automated Rules Management Section lumps ALL rules for the Account together in one huge list, so good naming conventions for organizing the rules is a good idea. (see below). 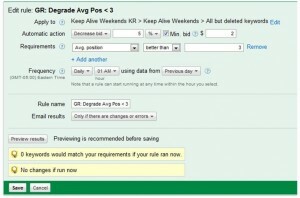 Rules at multiple levels might apply within an adgroup/for a specific KW. Example, you might target Position 3-6 for most of the KW in an adgroup, but exceptions for just one highly competitive term. This KW’s rules might have different avg. position triggers, or a higher max CPC with the same triggers. Google downtime might prevent a rule from running. 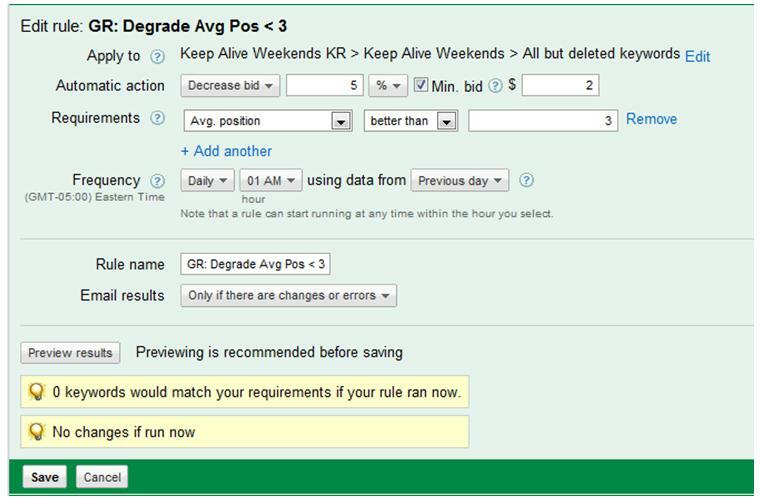 Timeouts in pulling data for the account might cause the rule to abort. Finally, rules have a 1 year lifespan after which they won’t continue, unless you manually update the ads (see Caveat #1). You will be warned as this anniversary approaches. (See https://adwords.google.com/support/aw/bin/answer.py?hl=en&answer=188713 for details on Rules Execution). Since all of the Automated Rules for an account are lumped into one report, with limited sorting/filtering abilities, setting up a good naming convention will help make the rules more manageable. I like to sort the rules from broadest to most detailed in scope, so at the top level, sorting into Campaign level, AdGroup level, and Keyword level buckets is a good first cut. The rules are presented Alphabetically (no filtering or sorting allowed), so by using this naming convention, the broadest-scope Campaign rules are listed first and the limited-scope KW rules are last. 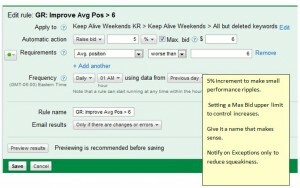 GR Improve Avg Pos > 6. GR Brand Terms Improve Avg Pos > 6. The above discussion suggests making bidding adjustments at most 1 time per day. In practice, you could do two updates per day: the first update would use a pair of rules as outlined above. Then, you could add a 2nd pair of rules that would trigger perhaps in mid-afternoon, and which used only TODAY’s positioning information to adjust. We recommend that this 2nd set of rules make smaller adjustments since they are operating on a small data set, and therefore more sensitive to noise in the data. Where your primary adjustment rules might make a 5% change, this 2nd set of rules could make a smaller 2% adjustment. This would make your rules more responsive to changes in the marketplace without causing your spend to bounce all over the place. There is a limit to how far you can take this technique, however. Since the Automated Rules can use “same day” data as the smallest slice, if you were to run a run in the morning using today’s data, and run a similar rule again in the afternoon, the afternoon test would be using the data from the morning as well, so you would in effect be performing a double-bump based on some of the same data, even if the morning rule corrected the underlying issue. Is Position Preference a Good Match for Your Account? Position Preference works, but is not a good fit for everyone. It works best for phrase and exact match keywords since broad match may make you eligible for a different group of search terms if your bids raise, and this in turn could cause your Average Position to plummet, in turn causing your bid-up rule to trigger on consecutive days trying to regain your position. You need to have a good Measure of Performance (a Key Performance Indicator, or KPI) so you can properly track which positions are actually working best for you. Finally, you need to have the attention to detail to build, monitor, and adjust the Automated Rules based on your results. The Automated Rules feature of Google AdWortds is still in its infancy, and we fully expect it to evolve over the coming months. As such, be prepared for new rule features to come into play, and perhaps some to be dropped. Even so, the judicious use of Automated Rules can help take some of the drudgery out of managing an AdWords Account, and replace features missing or lost from the User Interface. This entry was posted in Analytics, Google, Pay-Per-Click, Uncategorized by Mike Churchill. Bookmark the permalink.